The low inventory of homes for sale has turned the Seattle region into an “extreme seller’s market,” where prices continue climbing and buyers have fewer options. For a look at prices in your area, see the interactive map. Would-be homebuyers in the Puget Sound area continue to face slim pickings in a tight housing market. Fewer owners are listing their homes for sale, a trend that for months has made it harder for buyers to find homes, and keeps pushing up prices. The inventory of homes for sale in King, Snohomish, Pierce and Kitsap counties is down by 31 percent, with just 6,321 active listings in January — almost 2,900 fewer than a year earlier, according to the Northwest Multiple Listing Service. King County’s January inventory was also down 31 percent compared with a year ago, though it rose slightly to 2,427last month from 2,196 in December. “Seattle epitomizes the problem of strong population growth due to strong job growth and incredible lack of inventory,” said Skylar Olsen, senior economist at Zillow, a real-estate information company. With the inventory shortage, brokers report packed open houses and most houses receiving multiple offers significantly above asking prices. The homebuying process is “extremely frustrating,” said Emily Roberts, who finally bought a home with her wife, Kellee Roberts, last summer after losing out on multiple attempts. Prices are responding to demand by shooting up. The median price of a single-family home in King County in January was $490,970, an 11.2 percent increase from the same month last year. Median means half the homes sold for more than that, half for less. During the typically slower month of January, the King County median inched down from December, when it had hit $508,000 — a record exceeding the previous peak in July 2007. 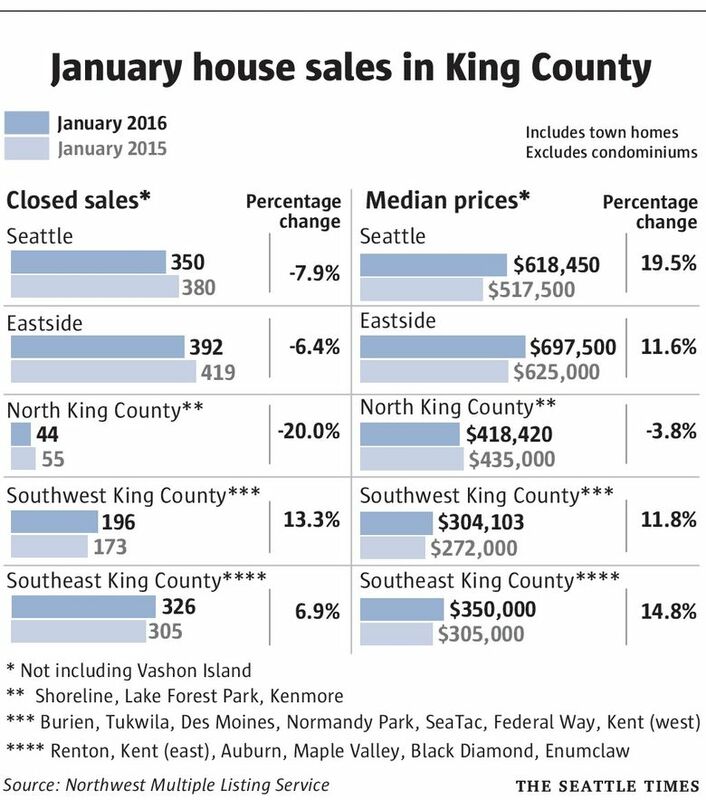 In Seattle, January’s median home price soared year-over-year by 19.5 percent to $618,450. 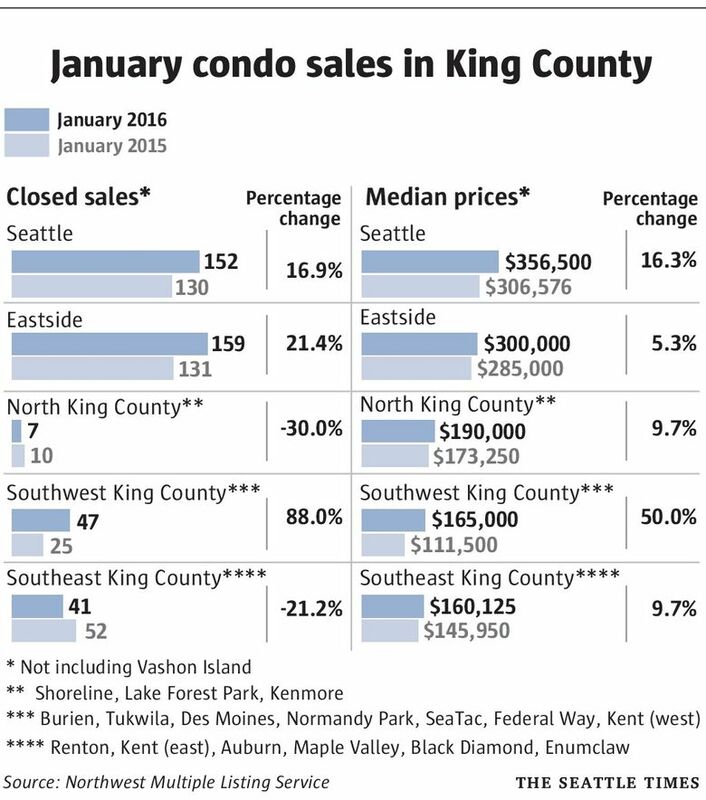 Snohomish and Kitsap counties outpaced King County for price growth. Prices in Snohomish County shot up by 16.6 percent over 12 months, to a median $378,950 in January. In Kitsap, prices leapt by 15.2?percent to a median $265,000. Pierce County had slower growth, with a 10 percent increase to $242,000. Condo prices saw even greater gains than single-family homes in January. The median condo price shot up over the year by 20.8?percent in Snohomish County, to $259,750, and by 18.3?percent in King County, to $282,250. “We are in an extreme seller’s market,” she said. Homes are also selling faster in King and Snohomish counties, where 70 percent are sold in the first 30 days compared with a historical average of about 30 percent, according to John L. Scott Real Estate. January often sets the tone for the rest of the year, said Nela Richardson, chief economist with real-estate listing site Redfin. Homeowners interested in moving later in the year often put their current homes on the market in January. But right now, many of those so-called “move-up” buyers aren’t listing their homes for fear they won’t find another house, Richardson said. The Puget Sound region continues adding jobs and residents, Olsen said, but the housing stock has not kept up and much of the new housing is for rent. Another problem is that even though home values are skyrocketing in some cities and neighborhoods, some homeowners still owe more on their houses than they are worth — known as being underwater — and can’t sell. For many buyers, the name of the game is compromise. 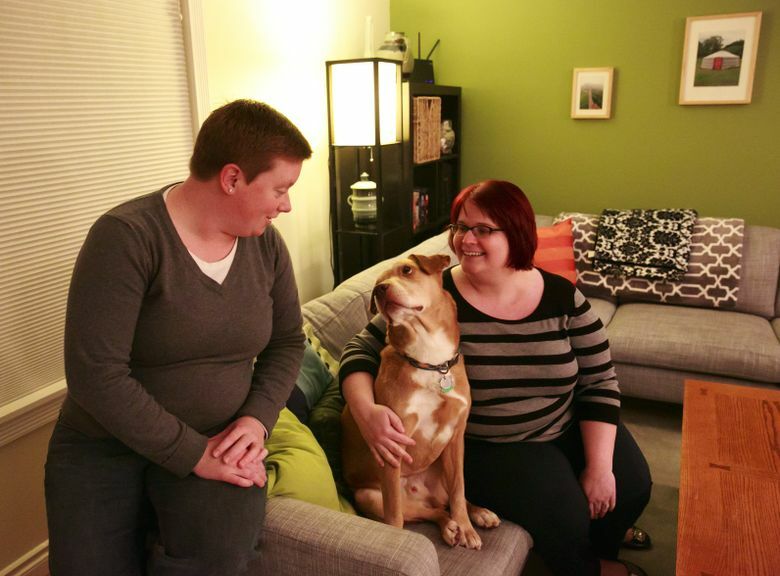 Take Kellee and Emily Roberts, who owned a townhome in West Seattle but wanted a larger home with a yard in hopes of expanding their family. They scoured West Seattle for their ideal home but were repeatedly outbid. It’s one of Seattle’s hottest neighborhoods; the median price skyrocketed by 46 percent in one year to $559,750 in January. In one stressful week, the couple submitted three offers. The first was rejected, the second house went to an all-cash buyer, and the third was finally accepted. The Robertses snagged a five-bedroom, 2,200-square-foot home with a huge backyard that came in just under their $400,000 budget. The downside: It’s in Burien. Experiences like theirs exemplify the concessions buyers must make, Olsen said, especially in the lower to midpriced home range. Michael Doyle, managing broker with Windermere Real Estate, said that in a tight market, buyers must be more open and dig deeper to find opportunities. Last month, he worked with some buyers who negotiated down the price of a Magnolia home to $1.6 million. The sellers originally listed the home for close to $2 million, then cut the price to $1.75 million. In most cases, however, sellers have the upper hand. Several brokers said buyers need to be prepared in order to make a winning bid. That often means having good financing in place. Some buyers do whatever they can to come up with larger down payments or avoid making an offer contingent on selling their current home, said Allie Howard, a Redfin agent in Seattle. Recently, a 1,770-square-foot, three-level home on Redmond’s Education Hill priced at $585,000 drew 19 offers. The winner went far above the asking price, but factors besides price also come into play, said Mike Beck, a John L. Scott broker who represented the buyers. “We had a strong offer,” he said. The buyers were able to secure a loan within a month and gave the sellers extra time to move out. That seemed to make the difference. For the Robertses, the frustrating experience of home-shopping was worthwhile in the end. But Emily Roberts said she often found herself in tears when talking with her broker, who doubled as a therapist at times. “Lots of people say don’t get emotionally invested in a house until you buy it, but that is impossible. I have to be able to imagine my family there,” she said. This story was updated Feb. 5 to correct the spelling of Zillow economist Skylar Olsen’s first name.